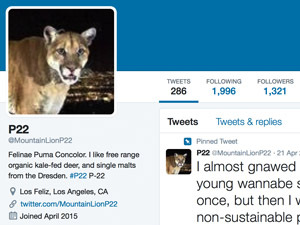 F92 is a survivor and an amazing mountain lion living in southern California. She was born of a Santa Ana population female and an eastern Peninsular Range male (we DNA paternity typed her and her 2 siblings to discover that M86 was their dad). M86 survived crossing an 8 lane highway (Interstate I-15) to bring his fresh genetic material to the low genetic diversity Santa Ana population. Many lions have not survived crossing that highway, ending up dead, hit by cars. One male puma (M86) captured in the Santa Ana Mountains had predominant genetic assignment… more to come soon. Credit Winston Vickers, UC Davis Wildlife Health Center. F92 (female) with cubs F126 and F127, walking through highway underpass in southern California in 2013. We have genetically DNA-typed her, sets of her cubs, and over 150 others from southern California. 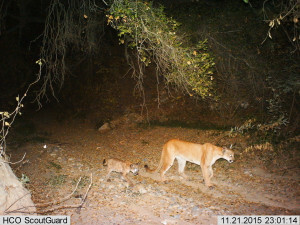 We determined fathers for cubs, used DNA to reconstruct family trees, and found very low genetic diversity and new highway barriers to gene flow for these imperiled mountain lion populations.